The moon of Enceladus is harboring a secret that has forced scientists to a surprising conclusion on its age. As we reported recently, a new study using computer modeling of the moons and rings of Saturn has found that they may very well be younger than the dinosuars — and it was the mysterious moon on Enceladus that led scientists to this startling conclusion. The study determined that the moons of Saturn have orbits that indicate that they are pretty young — just 100 million years old, easily younger than dinosaurs which had taken over the Earth by the time they formed, according to a SETI statement. Saturn has 62 moons, and one of them — Enceladus — helped scientists figure out this amazing fact. Enceladus is one of the most significant and most studied moons in the Saturn system. It is smaller than some of the inner moons, but it has a very geologically active surface. Scientists have determine it has geysers at the South Pole blasting ice water into outer space, and some have hypothesized that there could be life deep in Enceladus’ interior, which could harbor warm oceans. But the ice geysers may tell us something about its orbit as well. 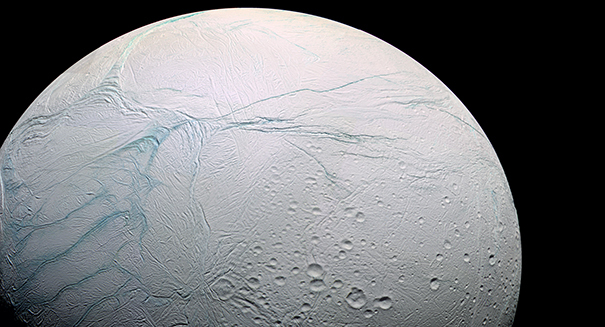 Scientists believe that the ice geysers on frigid Enceladus are from tidal interactions, which would nudge the orbit ever so slightly over the eons. But based on its current orbit, computer simulations suggest that it could only be at its current spot if it was born just 100 million years ago.